Tuvalu (/tuːˈvɑːluː/ (listen) too-VAH-loo or /ˈtuːvəluː/ TOO-və-loo), formerly known as the Ellice Islands, is a Polynesian island country located in the Pacific Ocean, situated in Oceania, about midway between Hawaii and Australia. 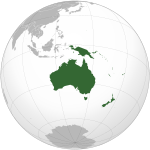 It lies east-northeast of the Santa Cruz Islands (which belong to the Solomon Islands), southeast of Nauru, south of Kiribati, west of Tokelau, northwest of Samoa and Wallis and Futuna, and north of Fiji. It comprises three reef islands and six true atolls spread out between the latitude of 5° to 10° south and longitude of 176° to 180°, west of the International Date Line. Tuvalu has a population of 10,640 (2012 census). The total land area of the islands of Tuvalu is 26 square kilometres (10 sq mi). ^ a b Munro, D. (1996). "Samoan Pastors in Tuvalu, 1865–1899". In D. Munro & A. Thornley (ed.). The Covenant Makers: Islander Missionaries in the Pacific. Suva, Fiji, Pacific Theological College and the University of the South Pacific. pp. 124–157. ISBN 9820201268. ^ "Majuro Declaration: For Climate Leadership". Pacific Islands Forum. 5 September 2013. Archived from the original on 23 March 2016. Retrieved 7 September 2013. ^ Christopher Pyne (7 April 2019). "Guardian Class Patrol Boat gifted to Tuvalu". Australian Ministry of Defence. Retrieved 7 April 2019. Te Mataili II was received by the Prime Minister of Tuvalu, the Right Hon Enele Sosene Sopoaga at a handover ceremony attended by the Minister for Foreign Affairs, Trade, Tourism, Environment and Labour, the Hon Taukelina Finikaso, the Minister for Natural Resources, the Hon Dr Puakena Boreham, and the Commissioner of the Tuvalu Police Service, Commissioner Luka Falefou. ^ "Australia hands over Guardian-class patrol boat to Tuvalu". Naval Today. 6 April 2019. Retrieved 7 April 2019. The 39.5 meter steel hulled patrol boat was built by Australian shipbuilder Austal under an AUD 335 million program that will see 21 boats gifted to 12 Pacific Island countries and Timor-Leste. ^ Lifuka, Neli (1978). Koch, Klaus-Friedrich (ed.). Logs in the current of the sea: Neli Lifuka's story of Kioa and the Vaitupu colonists. Australian National University Press/Press of the Langdon Associates. ISBN 0708103626. ^ Koop, Neville L; Fiji Meteorological Service (Winter 1991). DeAngellis, Richard M (ed.). Samoa Depression (Mariners Weather Log). 35. United States National Oceanic and Atmospheric Administration's National Oceanographic Data Service. p. 53. ISSN 0025-3367. OCLC 648466886. 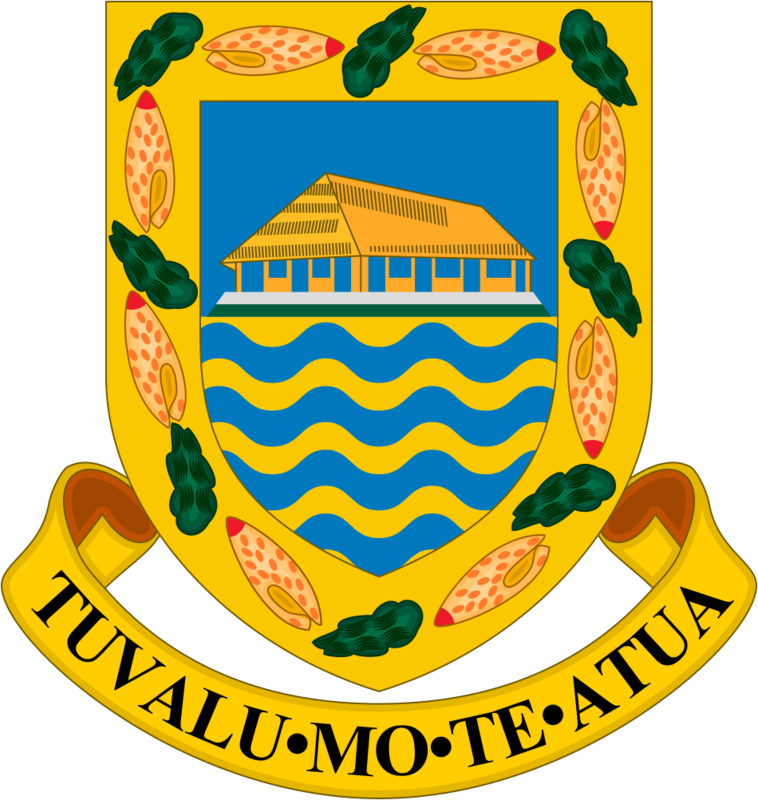 The domain name .tv is the Internet country code top-level domain (ccTLD) for Tuvalu. Global warming (recent climate change) is dangerous in Tuvalu since the average height of the islands is less than 2 metres (6.6 ft) above sea level, with the highest point of Niulakita being about 4.6 metres (15 ft) above sea level. Tuvalu islands have increased in size between 1971 and 2014, during a period of global warming. Over 4 decades, there had been a net increase in land area in Tuvalu of 73.5 ha (2.9%), although the changes are not uniform, with 74% increasing and 27% decreasing in size. The sea level at the Funafuti tide gauge has risen at 3.9 mm per year, which is approximately twice the global average.Tuvalu could be one of the first nations to experience the effects of sea level rise. Not only could parts of the island be flooded but the rising saltwater table could also destroy deep rooted food crops such as coconut, pulaka, and taro. Research from the University of Auckland suggests that Tuvalu may remain habitable over the next century, but as of March 2018 the Prime Minister of Tuvalu has indicated that Tuvalu is not expanding and has gained no additional habitable land. Funafuti is an atoll and the capital of the island nation of Tuvalu. It has a population of 6,025 people, making it the country's most populated atoll, with 56.6 percent of Tuvalu's population. It is a narrow sweep of land between 20 and 400 metres (66 and 1,312 feet) wide, encircling a large lagoon (Te Namo) 18 km (11 miles) long and 14 km (9 miles) wide. The average depth in the Funafuti lagoon is about 20 fathoms (36.5 metres or 120 feet). With a surface of 275 square kilometres (106.2 sq mi), it is by far the largest lagoon in Tuvalu. The land area of the 33 islets aggregates to 2.4 square kilometres (0.9 sq mi), less than one percent of the total area of the atoll. Cargo ships can enter Funafuti's lagoon and dock at the port facilities on Fongafale. The capital of Tuvalu is sometimes given as Fongafale or Vaiaku, however, the entire atoll of Funafuti is officially the capital since it comprises a single local government. This is a list of airlines currently operating in Tuvalu. Tuvalu has no active airlines. The United States Ambassador to Tuvalu is the official representative of the government of the United States to the government of Tuvalu. The ambassador is concurrently the ambassador to Fiji, Kiribati, Nauru, and Tonga, while resident in Suva, Fiji. Royal succession is governed by the English Act of Settlement of 1701, which is part of constitutional law. The traditional music of Tuvalu consists of dances, including fatele, fakanau and fakaseasea. The influence of the Samoan missionaries sent to Tuvalu by the London Missionary Society from the 1860s resulted in the suppression of songs about the traditional religions or magic and many songs were lost. As the influence of the missionaries diminished in the 20th century the traditional dances were revived and the siva dance tradition from Samoa also became popular. The fatele, in its modern form, is performed at community events and to celebrate leaders and other prominent individuals. Te titi tao is a traditional skirt placed upon another skirt - a titi kaulama - and tops (teuga saka), headbands, armbands, and wristbands continue to be used in performances of the fatele.Te Vaka, an Oceanic music group, contains Tuvaluans and musicians with Tuvaluan ancestry; Te Vaka performs original contemporary Pacific music or "South Pacific Fusion". The Parliament of Tuvalu, or Palamene o Tuvalu is the unicameral national legislature of Tuvalu. Polynesia (UK: , US: ; from Greek: πολύς polys "many" and Greek: νῆσος nēsos "island"; French: Polynésie, Spanish: Polinesia, Samoan: Polenisia, Māori: Poronēhia or Poronihia) is a subregion of Oceania, made up of more than 1,000 islands scattered over the central and southern Pacific Ocean. The indigenous people who inhabit the islands of Polynesia are termed Polynesians, and share many similar traits including language family, culture, and beliefs. Historically, they had a strong tradition of sailing and using stars to navigate at night. The largest country in Polynesia is New Zealand. The term Polynesia was first used in 1756 by a French writer named Charles de Brosses, and originally applied to all the islands of the Pacific. In 1831, Jules Dumont d'Urville proposed a restriction on its use during a lecture to the Geographical Society of Paris. Historically, the islands of the South Seas have been known as South Sea Islands, and their inhabitants as South Sea Islanders, even though the Hawaiian Islands are located in the North Pacific. Another term, the Polynesian Triangle, explicitly includes the Hawaiian Islands, as they form its northern vertex. The Prime Minister of Tuvalu is the head of government of Tuvalu. According to Tuvalu's constitution, the prime minister must always be a member of the Parliament, and is elected by parliament in a secret ballot. Because there are no political parties in Tuvalu, any member of parliament can be nominated for the role. Following parliament vote the Governor-General of Tuvalu is responsible for swearing the prime minister in. The office of prime minister was established when Tuvalu gained independence in 1978, although the post is sometimes considered to be a continuation of the earlier office of chief minister, which was created in 1975. If the prime minister dies, as has happened on one occasion, the deputy prime minister becomes acting prime minister until a new one is elected by parliament. The prime minister can lose his office by resigning, being defeated in a no confidence vote by parliament, or losing his seat in a parliamentary election. Several former prime ministers have been appointed the Governor-General of Tuvalu. The Church of Tuvalu, (Te Ekalesia Kelisiano Tuvalu) is the state church of Tuvalu, although in practice this merely entitles it to "the privilege of performing special services on major national events". Theologically the Church of Tuvalu is part of the Reformed tradition. Renewable energy in Tuvalu is a growing sector of the country's energy supply. Tuvalu has committed to becoming the first country to get 100% of its electricity from renewable energy sources by 2020. This is considered possible because of the small size of the population of Tuvalu and its abundant solar energy resources due to its tropical location. It is somewhat complicated because Tuvalu consists of nine inhabited islands. The Tuvalu National Energy Policy (TNEP) was formulated in 2009, and the Energy Strategic Action Plan defines and directs current and future energy developments so that Tuvalu can achieve the ambitious target of 100% renewable energy for power generation by 2020. The program is expected to cost 20 million US dollars and is supported by the e8, a group of 10 electric companies from G8 countries. The Government of Tuvalu worked with the e8 group to develop the Tuvalu Solar Power Project, which is a 40 kW grid-connected solar system that is intended to provide about 5% of Funafuti’s peak demand, and 3% of the Tuvalu Electricity Corporation's annual household consumption.Tuvalu participates in the Alliance of Small Island States (AOSIS), which is a coalition of small island and low-lying coastal countries that have concerns about their vulnerability to the adverse effects of global climate change. Under the Majuro Declaration, which was signed on 5 September 2013, Tuvalu has commitment to implement power generation of 100% renewable energy (between 2013 and 2020), which is proposed to be implemented using Solar PV (95% of demand) and biodiesel (5% of demand). The feasibility of wind power generation will be considered. In November 2015 Tuvalu committed to reduction of emissions of green-house gases from the electricity generation (power) sector to almost zero emissions by 2025. Tuvalu participates in the Olympic Games in the Summer Olympics. They have yet to compete at the Winter Games. The Tuvalu Association of Sports and National Olympic Committee was recognised as a National Olympic Committee in July 2007. Tuvalu entered the Olympic Games for the first time at the 2008 Summer Games in Beijing, China, with a weightlifter and two athletes in the men's and women's 100-metre sprints. Tuvaluan athletes have yet to progress past the first round of their events. The Tuvalu national football team is the international football team of Tuvalu. Football in Tuvalu is played at the club and international level. The Tuvalu national football team draws from players in the Tuvalu A-Division and trains at the Tuvalu Sports Ground on Funafuti. The national team competes in the Pacific Games. The national team is controlled by the Tuvalu National Football Association (TNFA), which is an associate member of the Oceania Football Confederation (OFC) but not a member of FIFA. Tuvalu – United States relations are bilateral relations between Tuvalu and the United States. In accordance with the law, citizens of all countries except the Schengen Area are required to have a visa to visit Tuvalu. Visas are obtained on arrival and are issued for a maximum stay of 1 month. All visitors must hold a passport valid for 6 months. Women in Tuvalu continue to maintain a traditional Polynesian culture within a predominantly Christian society. Tuvaluan cultural identity is sustained through an individual’s connection to their home island. In the traditional community system in Tuvalu, each family has its own task, or salanga, to perform for the community. The skills of a family are passed on from parents to children. The women of Tuvalu participate in the traditional music of Tuvalu and in the creation of the art of Tuvalu including using cowrie and other shells in traditional handicrafts. There are opportunities of further education and paid employment with non-government organisations (NGOs) and government enterprises, education and health agencies being the primary opportunities for Tuvaluan women. The number of women holding positions of Assistant Secretaries in government departments has increased from 20% in 2012 to nearly 50% in 2014. Also at the nine Island Kaupule (Local Councils) the representation of women has increased from 1 in 2012 to 3 in 2014.